The Bennelong Lawn at the Royal Botanical Gardens has unrivaled views of Sydney Harbour. The Sydney Harbour Opera House and Sydney Harbour Bridge create a spectacular backdrop to this amazing wedding ceremony location. With such an amazing backdrop you really do have to book early if you are considering the Bennelong Lawn as your wedding ceremony venue. Adorable Wedding Concepts wedding hire and wedding ceremony decorations perfectly compliment this garden location. The Eternity wedding ceremony package is one of our largest and most complete settings that is ideal for the large space. The Bennelong Lawn is perfectly suited to an outdoor wedding ceremony package, from the access arrival of the bride to the south westerly direction the aisle runs (towards the Harbour Bridge and Opera House) the garden feels like it has been designed for outdoor weddings. The wedding ceremony aisle runs straight towards the two iconic landmarks as show in our images, they really is no other option that you would even consider. Our low lying floral aisle decorations and shepherds hook with either floral balls, lantern or bucket work wonderfully well with the 9m x 1.5m wedding ceremony aisle. We like to utilise the space and create a wide aisle by setting the wedding ceremony chairs a little bit further away from the aisle. This has the added benefit of allowing the wedding photographer to move freely between the aisle and the seated guests. 32 white padded folding wedding chairs is ample for this location but you can add more if needed. We’ve always found that guests enjoy standing when a wedding is outdoors and people aren’t limited to sitting / standing directly behind each other. Another benefit of the Bennelong Lawn is the availability of space for the guests, no one will miss a single moment of the wedding ceremony, unless they’re late of course. Adorable Wedding Concepts have the perfect wedding hire prop for an outdoor wedding ceremony in our big love letters. The love sign can be positioned to either the left our the right of the wedding ceremony aisle to add another landmark to your special day. The Love letters become a fantastic group wedding photo opportunity once the ceremony is complete. 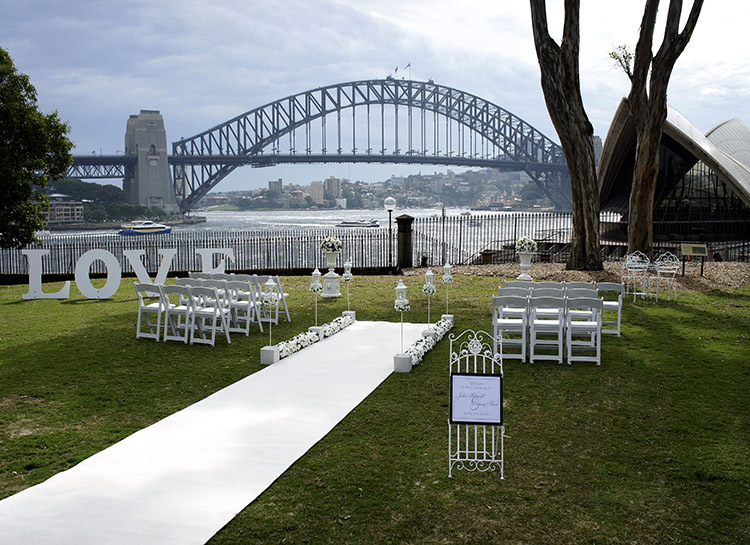 Gather your guests around and with the Sydney Harbour Bridge and Sydney Opera House in the background and the Love sign in the foreground you’ll have a group wedding photo that will stand the test of time. Our coloured chair sashes, included in the Eternity wedding ceremony package, adds a touch of colour without saturating a white wedding style. We add the sashes to the last row of chairs but when you enquire, discuss with our wedding ceremony stylist about have sashes on each chair if you are looking for something a little more. Our coloured wedding sash range is huge, 50 different colours, so we’re confident we can achieve the colour coordination of your wedding theme. We look forward to hearing from you, either call 0418 624 225 or go to our enquiry page and send us an email for an obligation free quote and consultation. Unsure about the Bennelong Lawn at the Royal Botanic Gardens as a venue? Contact us to discuss the style of wedding and type of venue you are looking for and we can provide you tips and insights from our 15 years of experience in the wedding ceremony industry. Guest Access: Bennelong Lawn at the Royal Botanic Gardens is accessed from the Palace Garden, Morshead Fountain and Conservatorium gates (all accessible off Macquarie Street). What you need to know: Royal Botanic Gardens allow 1 hour setup prior to the start of the ceremony booking time and will no allow access prior unless special prior arrangements have been made which involve additional site booking fees.